SIMI VALLEY, Calif. (Sep. 18, 2018) — Haibike USA, Accell North America’s pioneering ePerformance brand since 2015, today announces its all-new 2019 FLYON line of electric bikes, presented at the Interbike Expo. FLYON represents the first complete Haibike ePerformance system, featuring an exclusive new TQ electric drive system, an innovative operating system, superior connectivity and an entirely new, integrated frame design. Pictured: The NDURO 10.0 model from Haibike’s all-new line of 2019 FLYON bikes. Each FLYON bike is built around a new TQ HPR 120S mid-drive motor, which Haibike developed in collaboration with technology supplier TQ, specifically for the FLYON range. The HPR 120S is the most powerful mid-drive motor currently on the market, providing up to 120 Nm of torque. It is also extremely efficient, with modulation possible through five custom assist modes, from ECO to Xtreme. The motor is fully integrated into Haibike’s all-new, specially designed carbon-fiber frame, which features an integrated removable downtube battery mount for the 48 volt, 630 watt-hour, waterproof battery, developed exclusively for FLYON with tech partner BMZ. 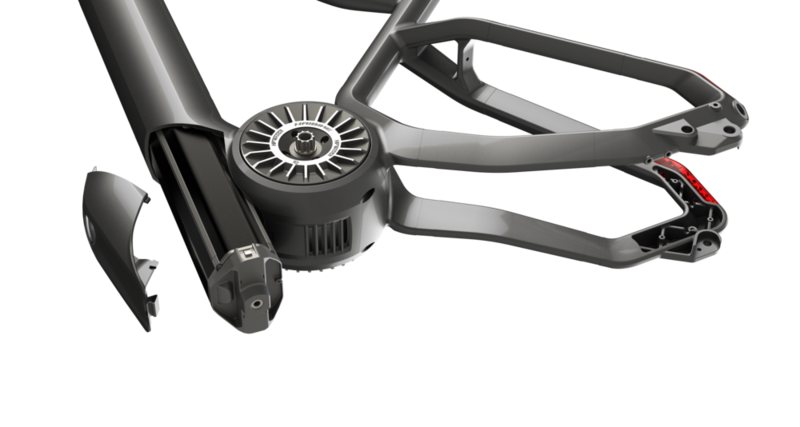 Pictured: Each FLYON bike features a new TQ HPR 120S mid-drive motor, and integrated removable downtube battery mount. The FLYON range features a unique, easy-to-reach remote thumb lever to control all functions of the bike, and a large color-coded transflective display, centrally positioned above the stem, with four changeable screens and dynamic speed measurement display -- so the faster you travel, the easier it is to read your speed. Another distinguishing feature of FLYON is its lighting system. With a built-in signature headlight providing up to 5,000 lumens, and the integrated Twin Tail Lights system, FLYON lets you ride safely and confidently after dark, on any terrain. Other notable components include Haibike’s own Direct Mount narrow-wide chain ring, available in 38 or 42T; a speed sensor disc that sends 18 signals per rotation; a Block-Lock headset to limit steering angle over the top tube; fully integrated cable routing for clean optics and improved reliability; and a flip chip that allows riders to adjust geometry to their own preferences. The New FLYON range will include 10 models across four distinct categories, all within Haibike’s renowned XDURO series: Three 180-mm travel NDURO models for top off-road performance; three 150-mm travel ALLMTN models, using mixed wheel sizes with a 29-inch front and 27.5-inch rear tire; two ALLTRAIL 140-mm hardtail models; and two 120-mm travel ADVENTR models, complete with panniers and ideal for trekking. 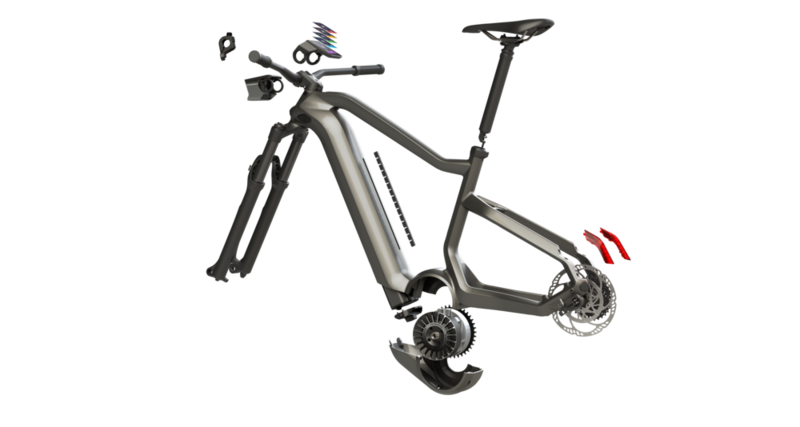 About Haibike: From concept to execution, Haibike ePerformance bicycles feature advanced design, innovation and breakthrough engineering. Haibike is the industry leader in ePerformance and offers the most comprehensive lineup worldwide. Haibike USA, established in 2015, is Haibike's North American subsidiary, exclusively selling the company's most popular ePerformance collection of XDURO and SDURO electric mountain, pavement, and commuter bikes. For more information about Haibike USA, visit www.haibike.com. About Accell North America: Accell North America (ANA) is the North American arm of the Accell Group – the leading bicycle company in Europe, and the global leader in e-bikes. The Accell Group is one of the largest and most stable bicycle companies in the world, and is the parent company of Diamondback, Raleigh, Ghost and Redline Bicycles, as well as Haibike, Raleigh Electric and iZIP e-bike brands. ANA also owns Beeline, a mobile bike service provider and powerful new tech platform for independent bicycle dealers.